HDU holdowns are pre-deflected during the manufacturing process, virtually eliminating deflection under load due to material stretch. They use Strong-Drive® SDS Heavy-Duty Connector screws which install easily, reduce fastener slip and provide a greater net section when compared to bolts. The DTT tension ties are designed for lighter-duty holdown applications on single 2x posts. The DTT1Z is installed with nails or Strong-Drive SD Connector screws and the DTT2Z installs easily with Strong-Drive SDS Heavy-Duty Connector screws (included). The DTT1Z holdowns have been tested for use in designed shearwalls and prescriptive braced wall panels as well as prescriptive wood-deck applications (see DTT deck tension ties for deck applications). For more information on holdown options, contact Simpson Strong-Tie. The HDU requires no additional washer; the DTT requires a standard-cut washer (included with DTT2Z) be installed between the nut and the seat. Strong-Drive SDS Heavy-Duty Connector screws install best with a low-speed high-torque drill with a 3/8" hex-head driver. HDU14 requires heavy-hex anchor nut to achieve tabulated loads (supplied with holdown). 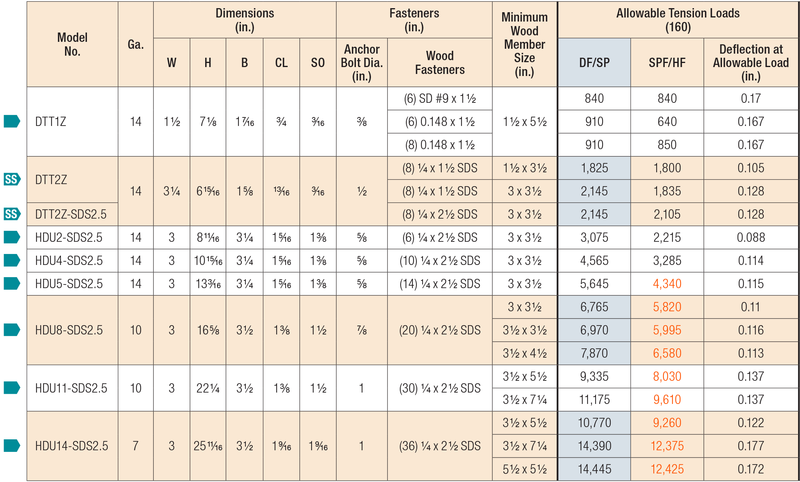 Where noted in table, loads are applicable to installation on either the narrow or the wide face of the post. HDU See specific model numbers for code listings.